Oh. There IS a book. Why have I been stressin?!! Pffffff. Old Capitol Books is Your Local Fine Used and Out Of Print Book Store in Downtown Monterey. 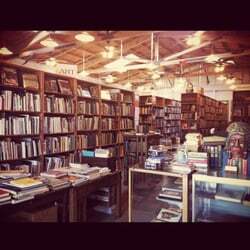 The Book Haven of Monterey California, now Old Capitol Books is Your Local Fine Used and Out Of Print Book Store. We stock a very wide selection of vintage books - 45,000+ titles. We have a special emphasis on California History & an extensive Military section, along with Children's Illustratred and Art Books. Located in historic Downtown Old Monterey, our store is at 559 Tyler Street, Monterey, CA 93940. We are directly across from the Simoneau Plaza / Monterey-Salinas Transit Plaza (on Munras Avenue) where local bus services connect you to the greater Monterey bay area. Our shop is just around the corner from the historic Robert Louis Stevenson house! There are many more local and historic sights of interest within a few minutes walk of our store. We also feature cards and artwork by select artists, and have a special section on Stienbeck. There is a large selection of regional titles and books by our nationally known local authors. You can find books for all ages and all interests. We have large sections for cooking, cookbooks, and gardening, as well most other hobbies. We enjoy helping you find just the right title and locating unusual and hard-to-find titles is a specialty. Please stop by for a browse and see what we have to offer your reading needs. Independent bookstores are locally owned and usually owner-operated stores. They cater to the needs of customers in a way that chain stores cannot. Independent booksellers care deeply about books and readers, authors and writing, and not just about making money. Why patronize an independent bookstore? Chain stores turn every community into a clone of the town down the road. Independent stores of every kind help communities remain unique. Also, chain retailers routinely funnel money out of small communities to their corporate headquarters in larger cities draining small towns of cash and capital. Because independent stores are locally owned their profits stay local and benefit the community. Locally owned businesses care about and know about their patrons and communities in ways that chain stores simply do not.